Graphix by Jim was established in 1992 while I was racing a Ducati 750ss in AMA amateur racing in the Southeast United States circuit. I thought it would be cool to get a custom painted helmet done by a then well known West Coast helmet painter. I gave it some thought and said I can do that myself. I was always painting something custom, whether it be my bicycles as a youth with spray bombs, RC Car bodies for friends, or my own personal motorcycles. I currently paint helmets for a variety of Drivers in many Race Series across the United States. Once people saw my work they usually had one done. 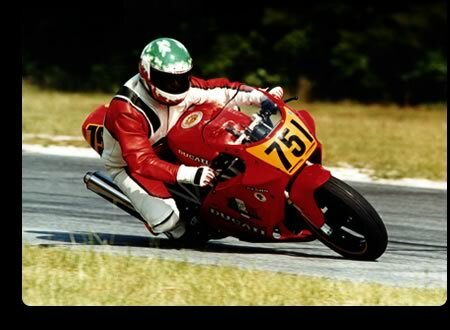 I hooked up in the early 90’s with Daytona 200 winner and WERA Formula Extreme Champion David Sadowski. From that contact many well known racers asked for my services. I currently paint helmets for a variety of Driver in as many Race Series across the United States. I enjoy what I do and it is always exciting to see a customer’s reaction to what I have come up with for them. I personally paint each and every helmet and take pride in what I do. I hope Graphix by Jim can be your next helmet painter now and into the future. Thanks for visiting my site and I hope you enjoy what you see. Feel free to drop me a line and or email me with any questions you may have.